Is Catriona Matthew one of the most underrated golfers? She doesn’t make much noise either verbally or visually. Just goes about her business in a very professional and polite manner. You don’t get to win a major championship after giving birth a few weeks before without having a great game and mental strength. Even Tiger didn’t achieve that. 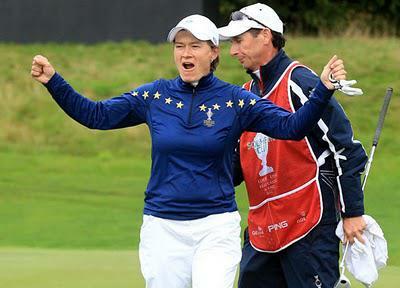 It was her fifth Solheim Cup singles victory in succession.